I will always remember the smell of scallops being grilled in the half shell. The chefs used to do it in the village pub where I worked as a washer upper, when I was younger. I remember the garlic, black pepper and the fresh green parsley, the crackle of shells under the hot grill, the salty bubbling butter, the always wanting and never getting. 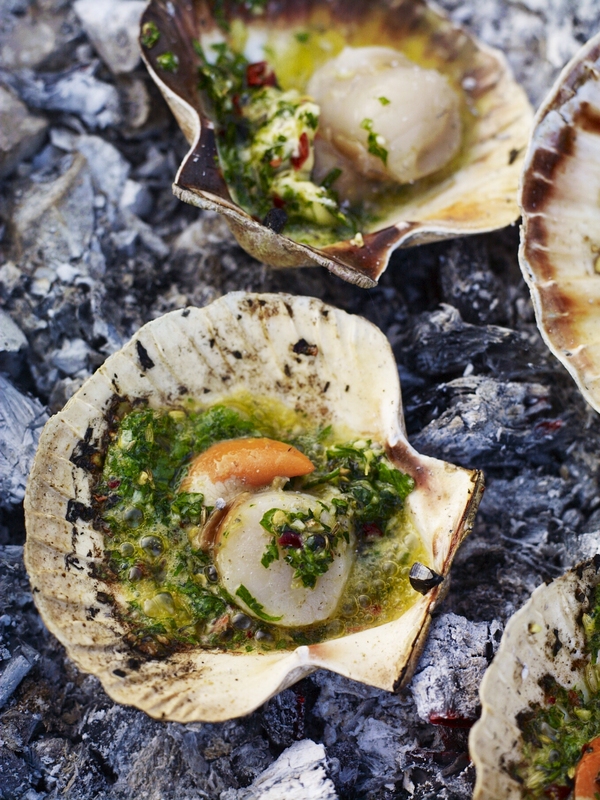 Here is my version, although, instead of setting the scallop shells under a hot grill, I’m cooking them in the glowing embers of a beach fire. Combine the soft butter with the oil, lemon zest, chilli flakes, fennel seeds, garlic and chopped parsley and season lightly with salt and pepper. Mix well to combine. Open the scallops. Reserve the lower part of the shell. Place a scallop in each half shell and spoon a generous amount of butter over each one. Level out the hot embers of the fire or barbeque with a stick or poker. They need to be nice and hot to cook the scallops. Using a pair of tongs set the shells down onto the glowing embers of the fire. They will heat up quickly and the butter will start to sizzle. The scallops will literally fry in their own shell. After a minute or so of sizzling flip the scallops over with out disturbing their butter laden shells. Cook for a further minute or 2 then remove each shell extremely carefully using the tongs again. If at any point you think the butter is burning before the scallop is cooked, rearrange the shell in a less hot part of the fire. Set the scallops down on plates and tuck in, but remember the shells will be hot.